Chè-licious Desserts & Snacks doesn’t do pho or rice plates. They instead focus on Vietnamese chè dessert drinks, salad rolls, and banh mi. Wicca remarked that this place felt over-decorated. I was ok about it. Their full menu is available online. Chè-Licious Special ($6.50) – contains (from the bottom up) pom pearls (water chestnut pieces made to look like pomegranate seeds), pandan jelly, jackfruit, toddy palm, longan, agar jelly, coconut milk, and crushed ice. Wicca is THE MOST PICKY when it comes to Asian desserts like chè. Check out this post from our LA trip when we went to the temple of chè, Thach Che Hien Khanh. She was skeptical about Chè-licious because they only do the multi-colour drinks when in fact there’s a whole world of desserts that fall under the category of chè. You see these kinds of drinks at most Vietnamese restaurants and they’re always just barely adequate. Wicca was VERY pleased and surprised that this was really good. The pandan flavour was strong and really came through with its aromatic, vanilla-like essence. The pom pearls had a definite little crunch to them. It’s the dessert drink that you can eat and drink at the same time! Pork Bomb Goi Cuon (Salad Roll) ($5.75). You might know the meat inside as Vietnamese sausage, or nem nuong. Comes with the typical hoisin/peanut butter (at least that’s how we make it at home) dipping sauce with crushed peanuts and picked daikon and carrot on top. I love a good, tight, and clean wrapping job! We do salad rolls like this at home using store-bought nem nuong from Chong Lee Market (great Chinese/Vietnamese market with two locations in Vancouver, one on Rupert and one on Victoria Drive). The store-bought nem nuong is good but can be a bit too syrupy sweet, which you really notice as you cook it. Plus I think it contains food colouring too, which is really unnecessary. Chè-licious’ nem nuong appears to be housemade and is nicely balanced. Not too sweet, not too salty, just a great pork sausage flavour. We noticed that they don’t put vermicelli noodles in this one, although they do in ones like the Rollin Classic. But they do add a little tube of deep fried egg roll wrapper that adds a crispy crunch. I love it when places do that. We added tableside chili to the dipping sauce. Good stuff! Ducking Good Banh Mi ($6.75) contains bbq duck, of course! The Ducking Good comes with their housemade mayo, and thank god they didn’t put too much and that it isn’t runny. I think the weakess with DD Mau in Yaletown is that they use too much of their aioli and when you eat it, it becomes a wet, drippy mess — especially if you get it to-go for eating later…it just gets too wet and saturated. The bbq duck tastes very similar to your typical Chinese BBQ duck, which is a good thing. The amount of duck in this sandwich is fair. We all know duck isn’t like industrial chicken meat, duck is expensive. Personally I’d love more meat but I think most people would balk at paying $8+ for a banh mi. This was one of my more meat-filled bites. Some parts of the banh mi had a bit less meat, but on the whole it was really tasty. The amount of meat was enough to balance out the amount of bread. The jalapenos weren’t spicy that day…bell pepper-level 🙁 . 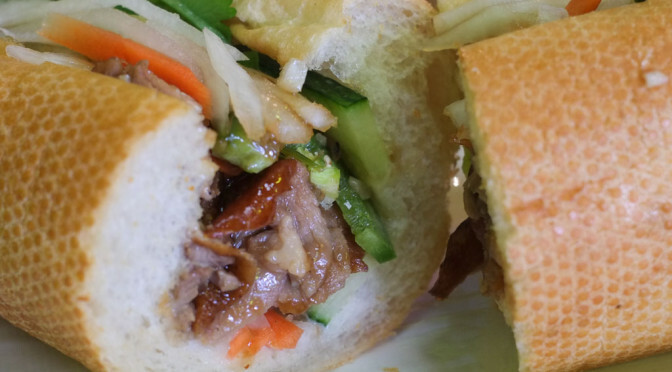 I look forward to trying their “Heo Yeah!” banh mi that contains crispy roasted pork. Chè-licious is a great place to check out if you’re in the West End. I would almost go out of my way to come eat here. Well, unless Wicca starts begging for chè, then of course we’re driving the 30 minutes (plus 5 minutes to find parking) to get here!